Instead of buying holiday greetings at your local drug store, create your own that come from the heart! 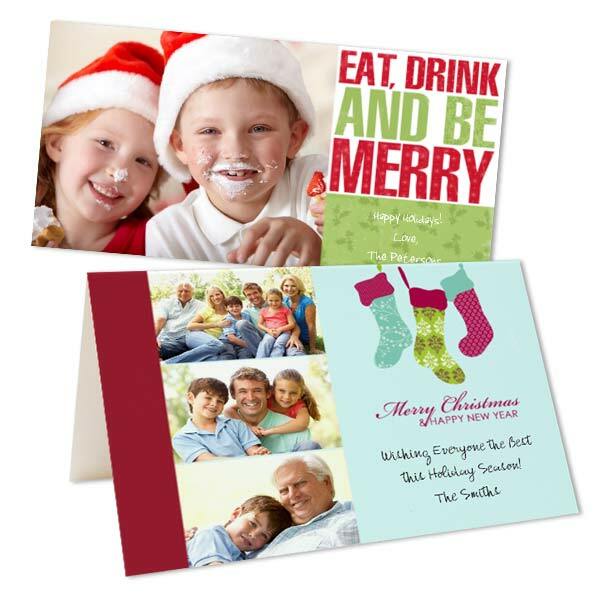 We offer cheap photo Christmas cards in a wide range of card styles. As a result, you can include your own photos, artwork, and a personalized message to share your holiday wishes this year in style. Upload pictures from your phone, tablet, or laptop and create the perfect greeting! Create a collage with pictures of your kids, pets, and favorite family moments. Or, upload your best family holiday portrait using our blank photo card option. Another great way of creating the Christmas greeting is by using your own artwork. Maybe you paint or like to create your own sketches. Scan and upload them to Print Shop for a photo card that is uniquely you. Above all, you can create your greeting using three classic card styles. Make your own double sided Christmas cards or folding Christmas cards which are both printed on quality stock paper. We also have custom photo cards and layouts, you’re guaranteed to design the perfect greeting that compliments your personality. Check out our complete collection of holiday photo cards or design your own custom Hanukkah cards. No matter the occasion, we have just the right greeting for you at Print Shop Lab!